When you visit Morocco you’ll be exploring a kingdom with a long and varied past. 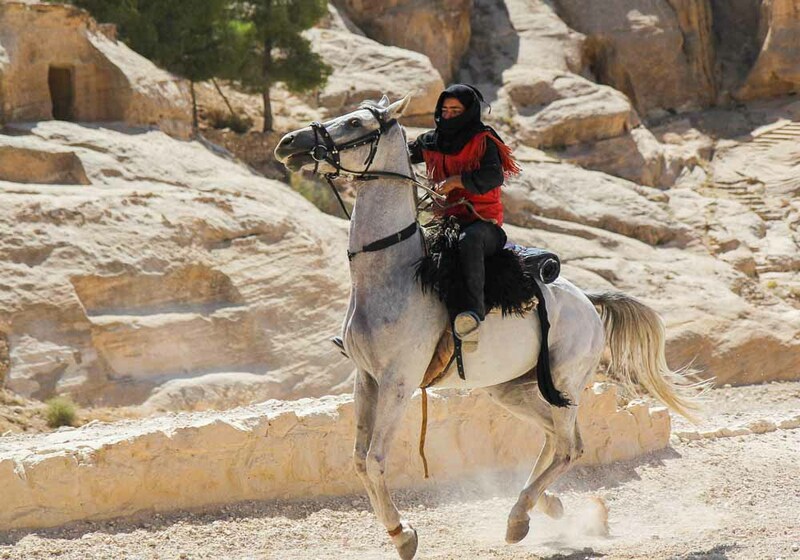 Over the centuries, peoples from three different continents have influenced the way Morocco is today, and the people are understandably proud of the resulting culture. To celebrate this rich heritage, Morocco holds a wide variety of festivals; in the bigger cities these can be vast events that carry on for several days, attracting artists and performers from across the country. 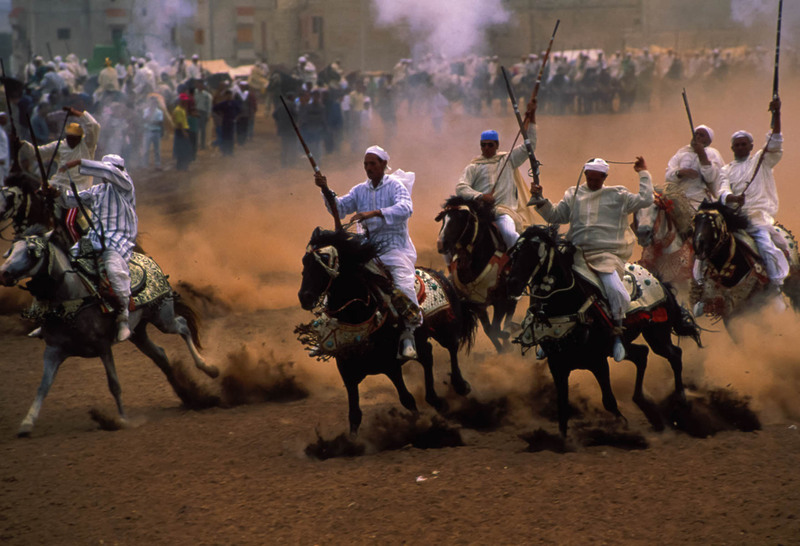 Traditional music weaves around more modern styles, fire-eaters perform alongside traditional storytellers, and the men of Morocco keep the traditions of horsemanship alive in Fantasias; spectacular displays of riding and control that take place outside city walls. The first cultural festivals in Asilah started in the late 1970s, thanks to the efforts of two friends who wanted to bring back the glory to what was then quite a dilapidated town. 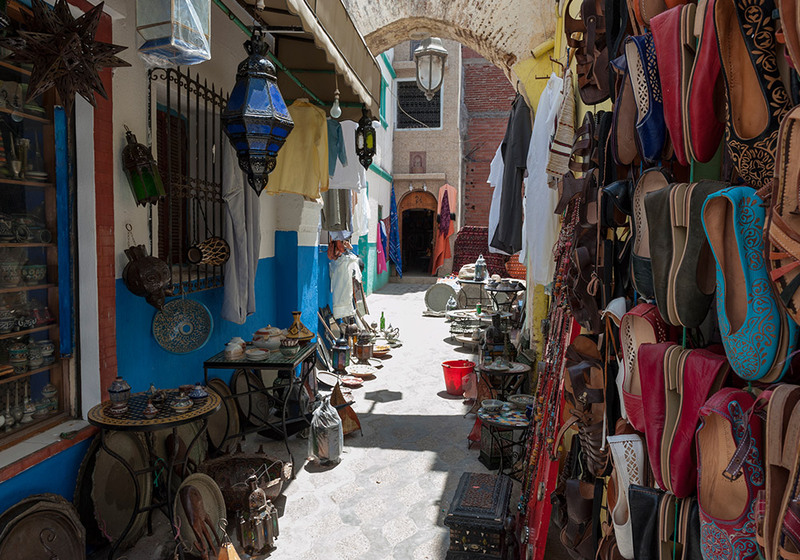 Over forty years on and Asilah is now a centre for arts and culture in Morocco, with festivals happening throughout the year and arts lovers coming from around the world. The main event is simply known as the Asilah Festival which lasts for two months of the summer. Artists, musicians and other performers, plus some 200,000 visitors, pour into the town for eight weeks of cultural workshops, demonstrations, exhibitions, concerts and even a three day horse festival. The beautiful Centre de Hasan II Rencontres Internationales, just inside the medina walls, hosts the event, with satellite performances happening around the town. One of the most striking activities is Wall Painting. 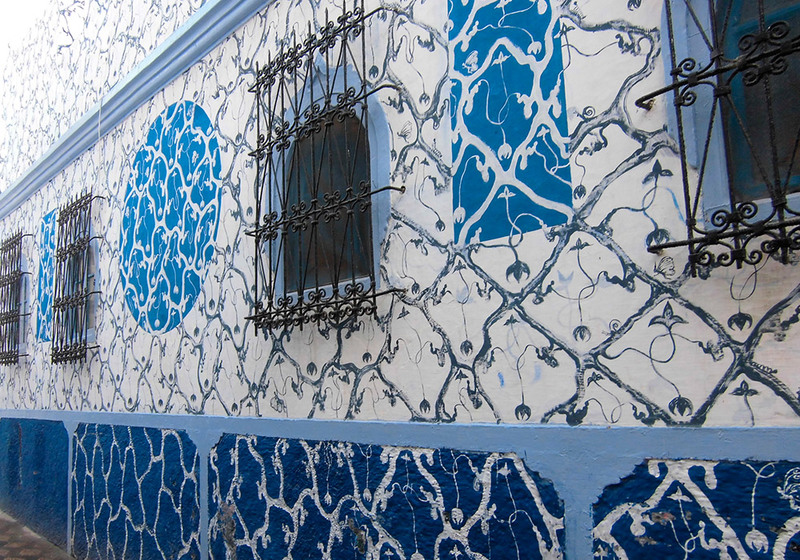 Every year the ancient walls of the medina are whitewashed to give artists a blank canvas, which they then cover with the most amazing creations. 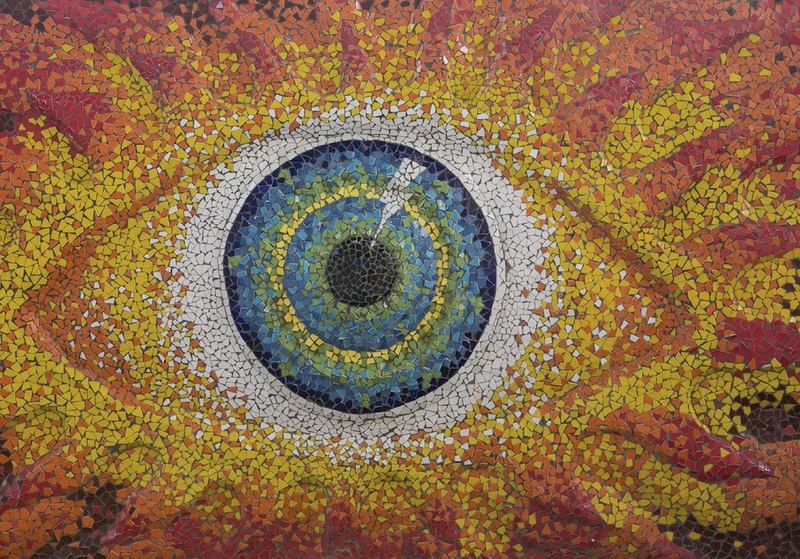 These murals are then left until the following year when the whole process starts again. 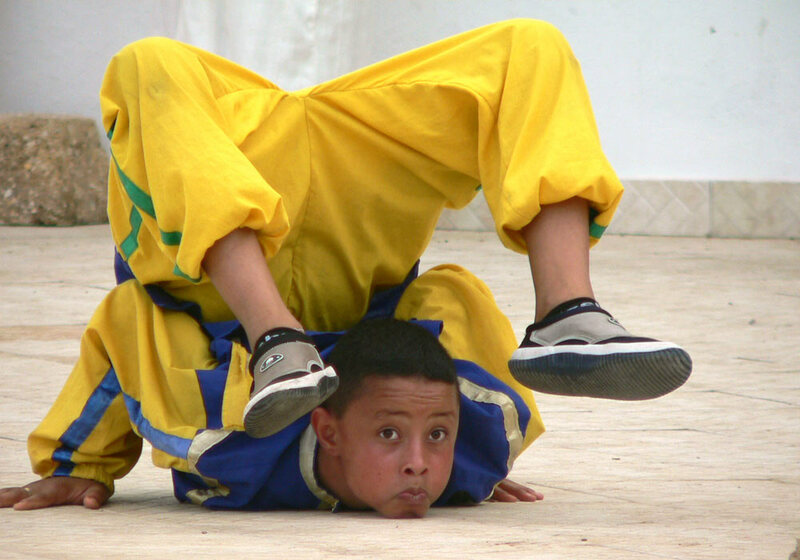 Meknes plays host to two renowned cultural festivals. The Festival of Volubilis takes place every September. It’s an event to celebrate the history of the nearby ruined city of Volubilis, which was once Roman, then occupied by the Amazigh and the Arabs and then the seat of power for many major Moroccan dynasties. 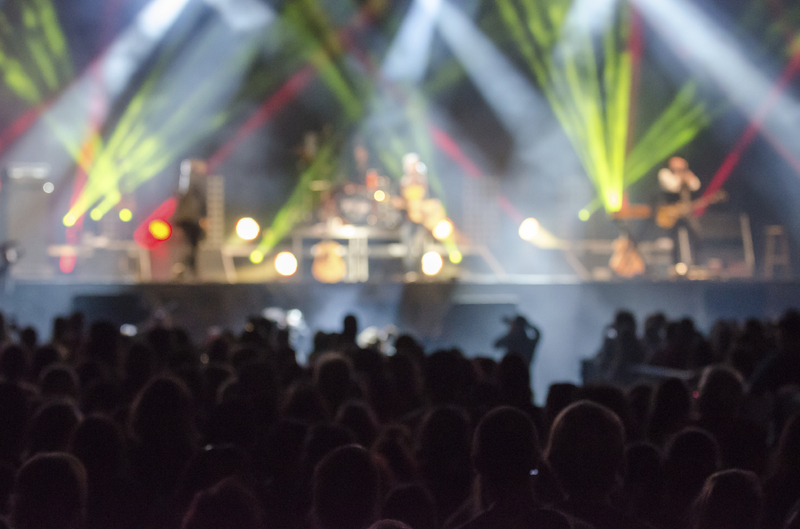 The festival was once held at the UNESCO World Heritage Site, but to preserve the ruins it was moved to Meknes where you can enjoy free musical performances from Moroccan and international performers. 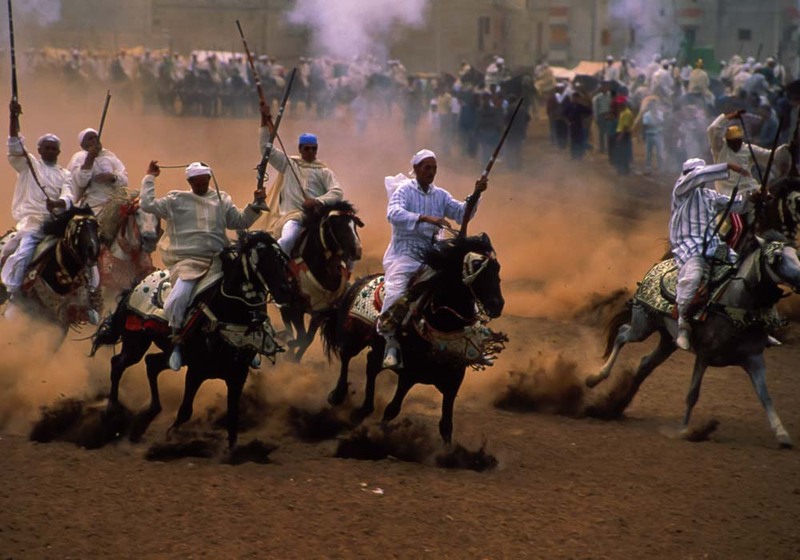 Meknes is also famous for its Fantasia, a mock horse battle where hundreds of horsemen and women gallop in a line firing synchronised shots in the air. It’s a traditional and stunning spectacle that will be one of the highlights of your stay. 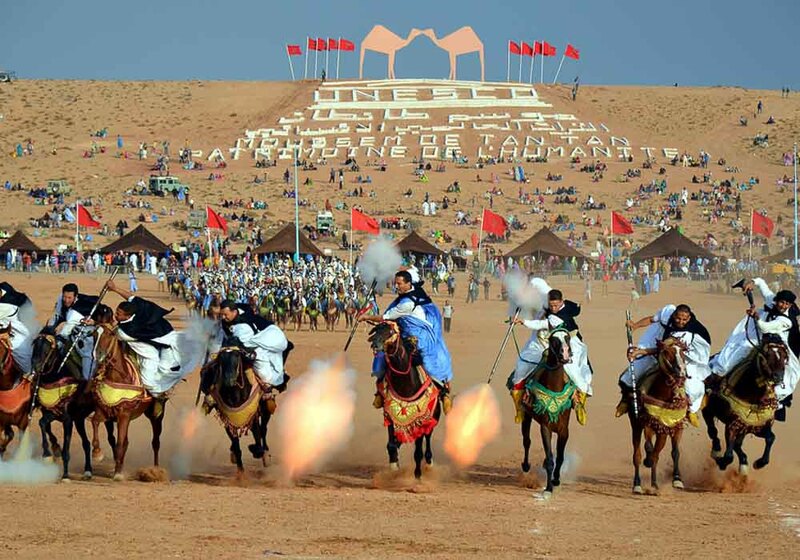 If you’re looking for one of Ouarzazate’s cultural festivals then May is definitely the time to visit the Door of the Desert. 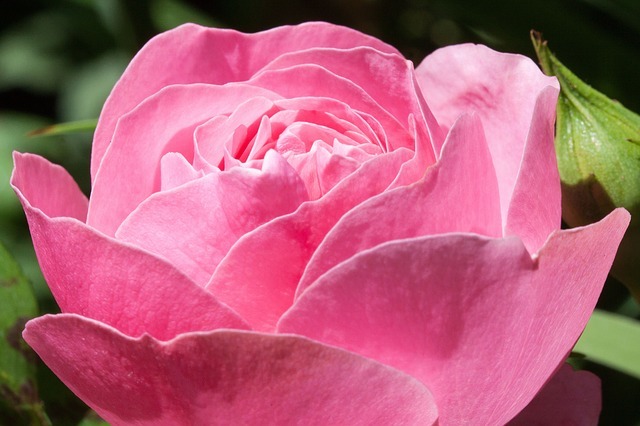 The first festival to look out for is The Rose Festival. Just a short drive from Ouarzazate is Kalaat M’Gouna, the rose capital of Morocco. Miles and miles of rosebushes grow around this desert oasis, a wildly colourful sight that fills the air with a heady perfume. 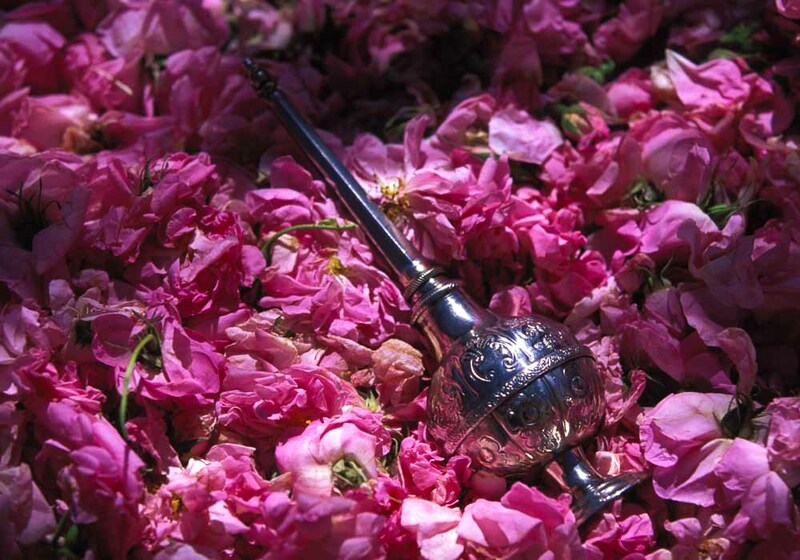 Rosewater is highly prized throughout the kingdom (it takes 3,000 kilos of petals to make just one litre) and people celebrate the harvest with dancing and singing through the night in the souk. Through a rain of rose petals a Rose Queen is elected to reign over the crop. 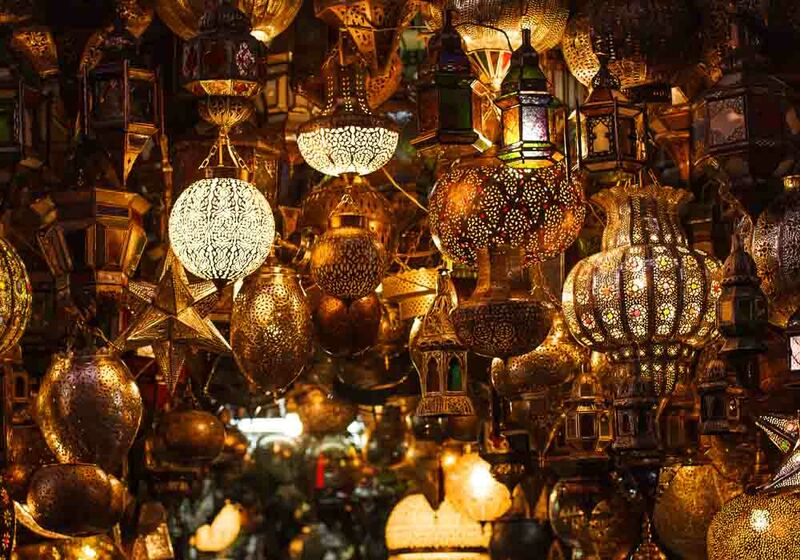 And like many places in Morocco, August is the month for Moussem – Ouarzazate celebrates Sidi Daoud with a pilgrimage, a special souk for craftsmen, and plenty of song and dance. 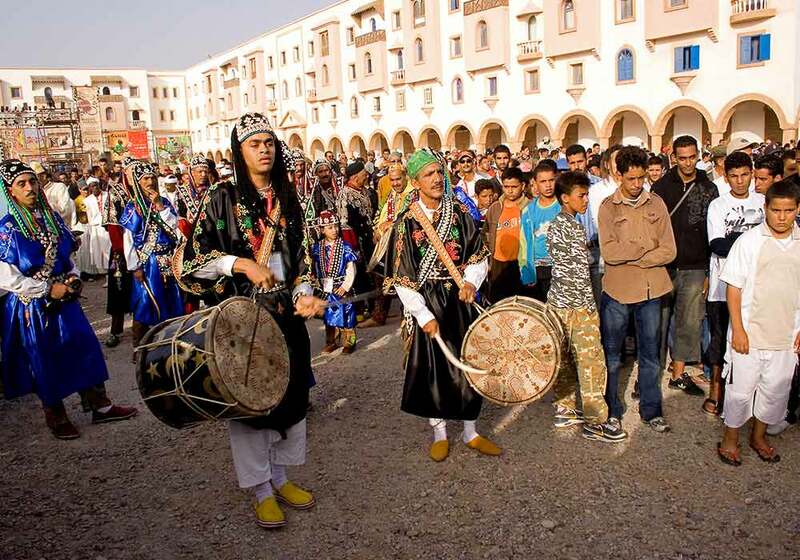 As befits a capital city, Rabat and the surrounding area is full of cultural festivals. One of the most spectacular is the Wax Lantern (or Candle) Festival that takes place in Sale, which faces Rabat across the Bou Regreg estuary. The procession of people carrying glowing lanterns dates back to the times when Corsairs carried wax lanterns to the sanctuary of town patron Sidi Abdallah Ben Hassoun, to gain his protection before a long voyage. The Feast of the Throne is celebrated on the 30th of July across the country, but most enthusiastically in the city where the King lives – you should make every effort to hear his address from the palace. And there are several Moussems – Mouley Bousselham in June, Dar Zhiroun in August and Sidi Ahmed ben Mansour in September.